Today, I’m telling you the truth about the “Fake it ‘til you make it” concept. You’ve likely heard this phrase before when someone is trying to beef up their confidence toward an effort they aren’t prepared for. Many pageant women think “Fake it til you make it” means to keep pretending you know what you’re doing until someone gives you a big break. As if, you could fake it over and over again and at some point someone will throw you a bone. Those girls never actually make it. The people that have succeeded with this concept are the ones who have found the right tools and put in the work to make it. Many people have succeeded in their careers by confidently claiming their knowledge, skills, or position before stepping into it. The difference between those that actually “Make it” really depends on who stops at the fake it part and who moves into the make it phase. YOU fake it, then YOU make it. Making it is a learning process. It’s the phase of gathering information, trying new things, and growing your knowledge base until you no longer have to fake it because you’ve made it a part of who you are. You have to actively participate in the making part, not just the faking part. Gary Cohn is a great example of this. He’s the current President of Goldman Sachs. He shared a cab with a financial big-wig who was starting a new branch of finance in his company. Gary claimed he knew all about the topic and was hired on the spot to start two weeks later. The truth is: he knew nothing at that moment, but he knew he could figure it out! In those two weeks he bought the only book he needed that walked him through every element of the topic until he knew more than anyone else. Now, Gary is the President of the financial giant worth almost 40-billion dollars. He faked it and then he made it. We’re all faking it as we’re learning… the learning is the making process. When I coach my clients, I tell them what the pageant expects. I help them to uncover their personal truth and then we blend that together, sometimes for the first time ever. My clients are wearing wardrobe they never would’ve considered, going from mascara and chap stick to full-face highlights and bronzer, and starting to walk taller than ever. They speak new confidence and realize their core values deeper than ever. Ann Smarty is now an SEO expert in the online world. She started by buying a website called SEO Smarty and charging low rates for web services to gain a lot of clients she could learn from. For every client, she took a deep-dive into exactly what they needed and learned everything she could on the topic until she was an expert. Then, she raised her rates and is now serving businesses around the world. The learning process is a transformation process from knowing nothing (or very little) to becoming a master. 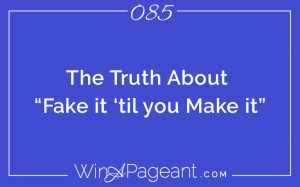 In pageantry, it’s Making YOU into a titleholder. For the first little while you’ll be faking it with the new wardrobe, posture, confident expression, and clear communication. But soon, you’ll have made it a part of who you are. Don’t skip the “Make it” part or you’ll never get there. Fake it until you Make it… but absolutely MAKE it a part of who you are. And, that my dear, is how you win a pageant.